Join us to get plugged in to leadership success! Leadership Excellence And Development (LEAD) with the Leadership Academy of North Florida! 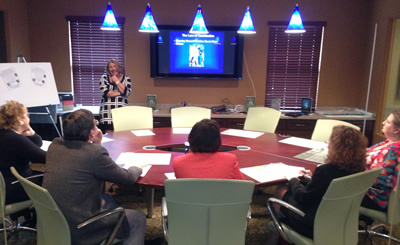 Extraordinary, innovative leadership education is available in the Tallahassee area! Tallahassee Community College has joined forces with Gabrielle Consulting's Plugged In Leadership, led by Dr. Gabrielle K. Gabrielli, to provide unprecedented leadership development opportunities to equip talented professionals. The 12-month program includes rigorous leadership curriculum, mentoring, coaching, assessments, and much more. For more information and to apply to be part of the 2016 class, check back for updates! 6-week Leadership Mastermind Course on Everyone Communicates Few Connect takes place Fridays in a power lunch setting. The next class will take place by demand. $398 cost includes lunches, book, and much more. Class size is limited to 10. Participate in the classroom or virtually.